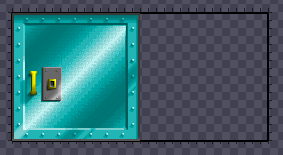 This TEXTURES entry is scaled by 2 (making it 2x smaller in the game world) and is being used on the midtexture of a 64-unit-long linedef. The front side of the linedef is completely ordinary, but I gave the backside's midtexture a scale of -1 so that it would appear flipped on the other side. This line is manipulated via ACS to scroll rightwards upon activation and then after a delay, stops the scrolling and adjusts the texture x offset to the x offset it had when it stopped scrolling. For personal reasons, I'd rather not publicly release the archive as it is but I can easily PM someone with the .pk3 so that they may test it themselves. Last edited by DenisBelmondo on Tue Jul 31, 2018 2:41 pm, edited 1 time in total. So, where's the testable map? A video cannot be debugged. Apologies, just edited my first post saying that I can PM you with the archive at the same time as you replied. Sent. I'm not really sure which one is correct. I remember the change in the hardware renderer being deliberate, it may actually be that the software renderer was changed later as it saw quite a bit of refactorings. But I do not recall the details about this issue and will have to find the needed info first. For sure, thanks for the info.